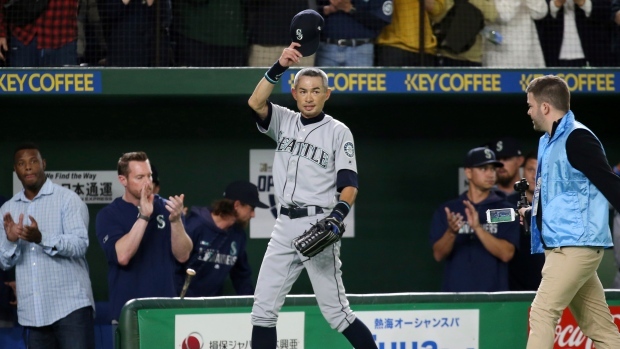 TOKYO — The magnitude of the moment — of sharing the field with the towering Ichiro Suzuki in his farewell — left Seattle Mariners teammate Yusei Kikuchi in reverential silence. Asked what that experience meant, the Japanese rookie pitcher paused for a full minute. "Since spring training until now, Ichiro told us that it is a gift for him to play in Tokyo," Kikuchi finally said through a translator Thursday night. "But for me, he gave me the greatest gift that I can play with him." Ichiro was showered with cheers and chants while taking his final bow , and the Mariners sent him out with a win by beating the Oakland Athletics 5-4 in 12 innings. On the day Kikuchi pitched well in his big league debut, Ichiro concluded a magnificent career that lasted nearly three decades. The 45-year-old Ichiro went 0 for 4 in the second game of the Major League Baseball season. He got a chance at a storybook ending at the jammed Tokyo Dome when he came up with two outs, a runner on second base and a tie score in the eighth inning, but grounded out. Ichiro, whose pro career began in his homeland in 1992 when he was 18, took his spot in right field to begin the bottom of the eighth. He then was pulled to one more ovation, punctuating his walk with waves , tips of the hat and hugs as cameras flashed all around the park. Ichiro's teammates met him outside the dugout for a proper send-off in a three-minute tribute. Kikuchi, who worked into the fifth inning, bowed to Ichiro — the 27-year-old lefty was tearing up as he buried his head into Ichiro's shoulder. "For me it doesn't get better than tonight," Ichiro said through a translator. "Nothing can top what happened tonight for me." In a fitting scene — a passing of the torch, possibly — Ichiro caught a flyball to end the fourth inning and Kikuchi waited for him outside the dugout for a fist bump. Kikuchi could be the next big star from Japan, having signed a contact in January that could be worth $109 million over seven years. "I enjoyed myself. I had fun. I wasn't necessarily nervous. I didn't shake. I was ready," Kikuchi said. "I knew it was going to begin at the Tokyo Dome, where my journey as a major leaguer began." "I wouldn't say I was excellent, but I as able to play before the Japanese fans. I felt great support from them and I felt lucky." Kikuchi became the first Japanese-born player to make his major league debut in Japan. Showing a firm fastball and sharp slider, he gave up four hits in 4 2/3 innings. Marcus Semien hit an RBI single on Kikuchi's 91st and final pitch, making it 3-1. Roenis Elias relieved and got Matt Chapman to hit a comebacker, but first baseman Jay Bruce dropped the throw, allowing a run to score that pulled the A's within 3-2. Kikuchi, who went to the same high school as Los Angeles Angels two-way phenom Shohei Ohtani, signed with Seattle in January after pitching for the Seibu Lions in Japan. Effectively hiding the ball in his delivery, Kikuchi often kept Oakland batters off-balance while striking out three and walking one. Domingo Santana, who hit a grand slam in Seattle's 9-7 win in the opener Wednesday, beat out a double-play relay with the bases loaded to drive in the go-ahead run in the 12th. Ryon Healy and Mitch Haniger homered for the Mariners, off to their first 2-0 start since opening 3-0 in 2014. Khris Davis hit a two-out, two-run single with the bases loaded in the Oakland seventh to make it 4-all. Davis led the majors with 48 home runs last year and homered Wednesday. Davis struck out with the bases loaded to end the 11th. "It was disappointing. We had our chances," A's manager Bob Melvin said. "I felt like a couple of times we had them on the ropes and had a chance to win the game, and we didn't. So it's frustrating." "You don't want to come here and lose two games, but we'll regoup and take a few days off," he said. Dee Gordon singled off losing pitcher Ryan Buchter to begin the Seattle 12th. He later scored on Santana's one-out grounder when Semien and second baseman Jurickson Profar were slow on the turn. Zac Rosscup got the win and Hunter Strickland closed for his second save. Ichiro was all smiles as he greeted his teammates after the final out. A 10-time All-Star in the majors, Ichiro got 3,089 hits over a 19-year career in the big leagues after getting 1,278 hits while starring for nine seasons in Japan. His combined total of 4,367 is a professional record. Ichiro went 0 for 1 with a walk in Wednesday's opener. A's starter Marco Estrada allowed three runs in five innings. Mariners: 1B Daniel Vogelbach didn't start, a day after being hit in the left elbow by a pitch. Athletics: Top A's pitching prospect Jesus Luzardo will be shut down for four to six weeks because of a strained left shoulder. The 21-year-old was in the mix for a rotation spot. Mariners: Back to spring training for the M's. For the players who didn't make the trip to Japan, there are exhibition games Thursday night in Arizona against the split-squad Reds and Friday night with the split-squad Angels. Seattle opens the regular season at home March 28 against the World Series champion Boston Red Sox. Athletics: The A's get a couple days off before resuming exhibition play Sunday at the Coliseum vs. San Francisco. Oakland begins the regular season March 28 at home against Mike Trout and the Angels.